Rivets are typically manufactured with either Oval, Flat, Flat Countersunk, or Special Purpose heads. Oval Head rivets are the most common type of rivets, with a wide variety of fastening applications. Flat Head shoulder rivets are often used when the pieces joined by the rivet are free to rotate. 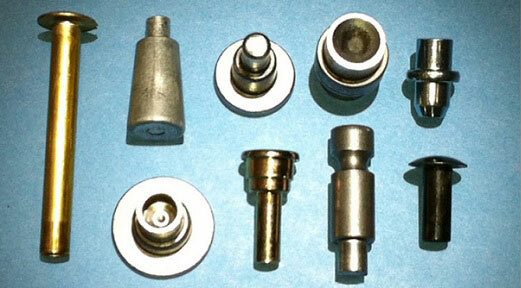 Countersunk Head rivets are used when the rivet head must be flush with the pieces that it fastens. Special purpose rivets can be designed for almost any application, from aluminum ladders to zinc plated rollers. A rivet's body is usually formed into a straight shank or a shoulder. All materials available in various cold heading quality alloys. Non-standard materials are available through special order. Your personalized specifications and requirements need to be provided for accurate quotations. Non-standard finishes are available through special order. Your personalized specifications and requirements need to be provided for accurate quotations.